Fudge is a classic Christmas dessert but not one I have a ton of experience with. I've made a couple of different types in the past and found it to be much easier than I expected and this recipe ended up being very easy as well. The most time consuming part is chopping up the chocolate. If you haven't finished your Christmas baking yet, here are some other candy recipes you may be interested in. And check back tomorrow for Peanut Butter Fudge! Line an 8x11 inch baking sheet with aluminum foil leaving at least 1" overlap on all sides. You want to use a baking sheet that has at least a 1" high rim. Spray foil with nonstick spray. Set up a double boiler with a couple inches of water over medium heat. In a heat proof boil or double boiler, toss chopped chocolate with baking soda and salt until well distributed. Stir in sweetened condensed milk and vanilla. Set bowl over simmering water, making sure that bowl doesnt touch the water. Stir continuously with a rubber spatula until chocolate is almost fully melted. It will likely take about 2-4 minutes to melt, remove bowl from heat when there are just a few remaining pieces and stir until smooth. 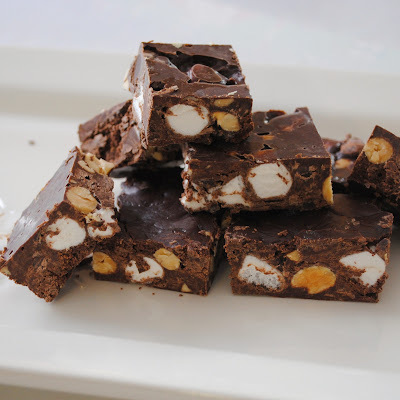 Stir in marshmallows, peanuts, and chocolate chips. Mixture will be quite thick. Quickly transfer mixture to prepared pan and smooth into an even layer. Refrigerate until set, at least two hours. Use foil overhang to remove fudge from pan, peel off foil and chop into approximately 1" square pieces. A lady at work always makes this around Christmas and it is one of my favorites. Yours looks delicious!